Check The Content Creator’s Club! 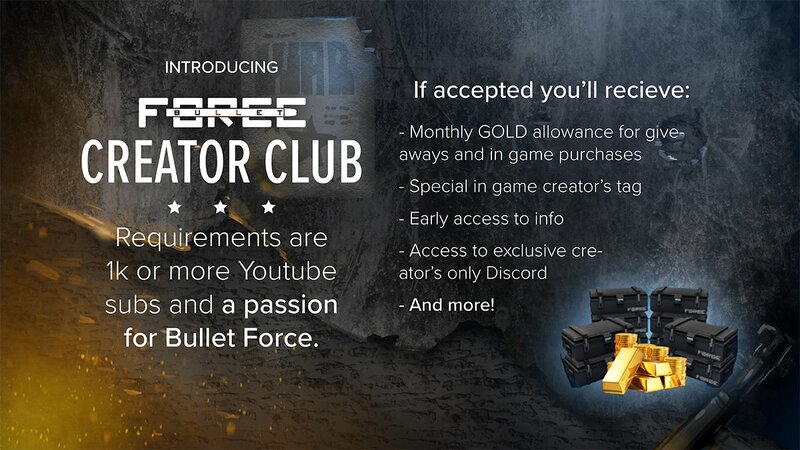 The Bullet Force developers have decided to make a brand new Content Creator's club! If you join it, you can have many advantages! Such as early update info, gold and the new [C] tag in-game! To join this fantastic club, you have to have a minimum of 1K subscribers on YouTube. The more subscribers you have, the more advantages you can have. For more info about this new club, then feel free to check the URL below! We are glad to announce that the new moderators are now accepted into our team. Some of them are familiar faces that you may already know from their YouTube videos. Some of these moderators will be patrolling the forums. Out of more than a thousand applications, only a little more than ten made the cut. YouDoneSon has made a video for all of you to meet the new moderators! We wish these new moderators the best of luck in performing their newfound job! New moderator applications now closed. 11 new mods joining us soon! Congratulations to those who have been successful, hopefully we'll find out who they are in the next couple of days. Sneaky peek: Three new Bulletforce guns at once. Just to avoid future confusion. And as if that's not enough, at last! An ingame link to the forums! Exciting times folks. Exciting times. Three new weapons coming in next Bullet Force update! We present you three new weapons to come in the new Bullet Force update! On a side note, Forward Assault will be getting an option to switch between tags you already have from spending money in the next update. The MP40 will the first historical weapon since the Shuriken to be added into the game! The Thompson will also be added in this update! It will be the only new gold exclusive weapon in this update. Bullet Force Mod Application Round 2! Once again, YouDoneSon has been asked to find additional moderators for Bullet Force. The previous round emphasized moderators for the Asian regions. This time, the restrictions on regions are much more lenient. However, we would still like to see more moderators in non-US regions. We’re always going to need more mods in the US servers, so this is your chance for some of you who’ve been waiting to be mod. Please watch YouDoneSon’s video for the instructions on the application. Good luck to everyone who applies to become a Bullet Force moderator! We present you the new main menu and the rank icons! Readability will be improved with the new menu. Please let us know what you think about these. [Forward Assault] Crosshair color customization feature coming next update! We present you the upcoming crosshair customization feature! 'Turn off chat' option coming in next update! Greetings warriors of the Bulletforce world. Good news from the Dev team, in the next update the long awaited 'disable chat' option will be arriving. So should you choose to do so, you'll no longer have to put up with all the garbage people often talk in there. Just a heads up.. New mod applications coming soon! Just a heads up folks, no doubt there will be an official announcement soon along with a YDS video with all the details of how to apply .